I hope you'll indulge me while I bring you one more garden post until things are farther along early next month. This is Bernardii II or "Bern" after my BIL as we like to call him. I've never seen such large blossoms, let alone white and before long he will be totally covered with them. He's very long blooming - last year he showed his colors well past the first frost! Yesterday I did a little planting, which I'm allowed as long as I bend down and get up properly. 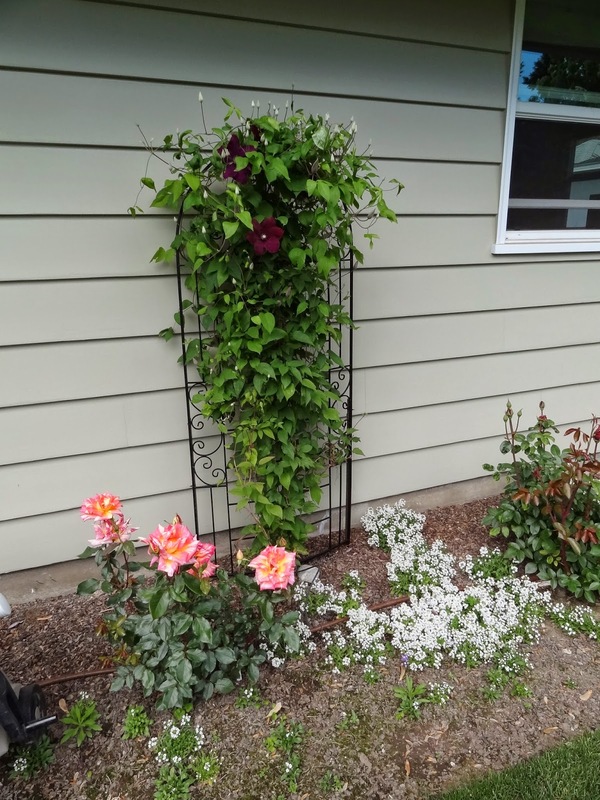 See the little plants with white flowers between Bern and the climbing rose? They're called "Steppables" meaning you can walk over them and not do any damage. Mr. Squash and I have become quite enamored with all sorts of these varieties! I'm hoping there will be a white carpet there before long! Turns out my Kiwi is self-pollinating. See the little "beads"? There are lots and lots of these baby Kiwi's growing bigger by the day! This is the only rose from the original owner of the house that didn't freeze and die two years ago. Before long it will be a mass of yellow and go all summer and fall. The Allysum self sows and will completely cover the ground before long. 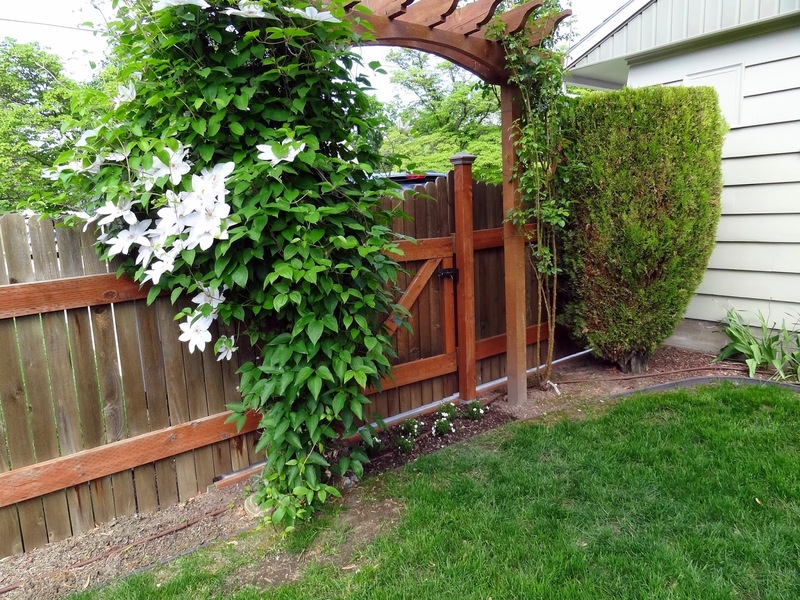 This is Barbara the Clematis on her new trellis. She is named after my SIL. Can't wait for the mass of deep red blooms to take off!. The Allium is doing well once again. 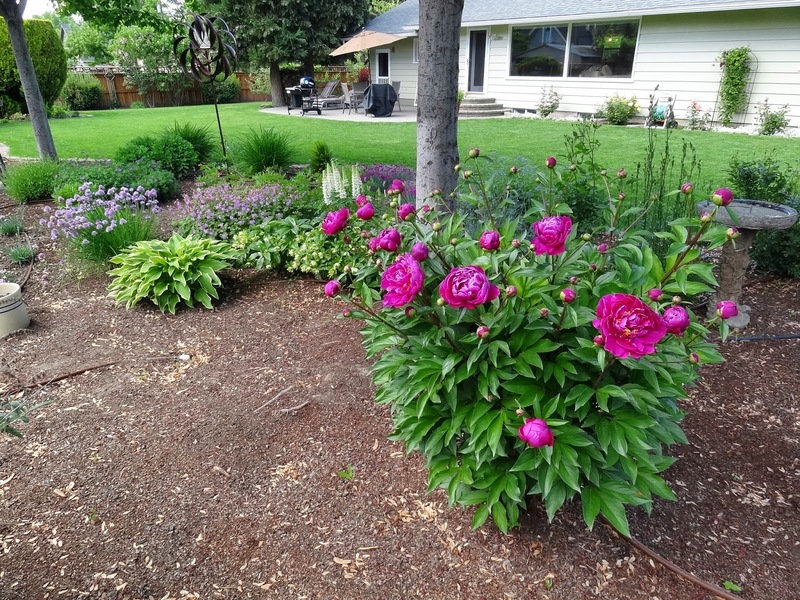 Peonies are just beginning to bloom out. I'll need a bigger cage for them next year. Mr. Squash has babied this rhody. It was a sickly creature when we moved here 5 years ago. She's nice and healthy now! I continue to improve in small increments each day. My goal is to be able to rotary cut soon so I can get back to sewing! So gorgeous. I love Bern and Barbara. It's so nice to hear you're making good progress in your recovery. Pretty soon the rotary cutter will be smoking! 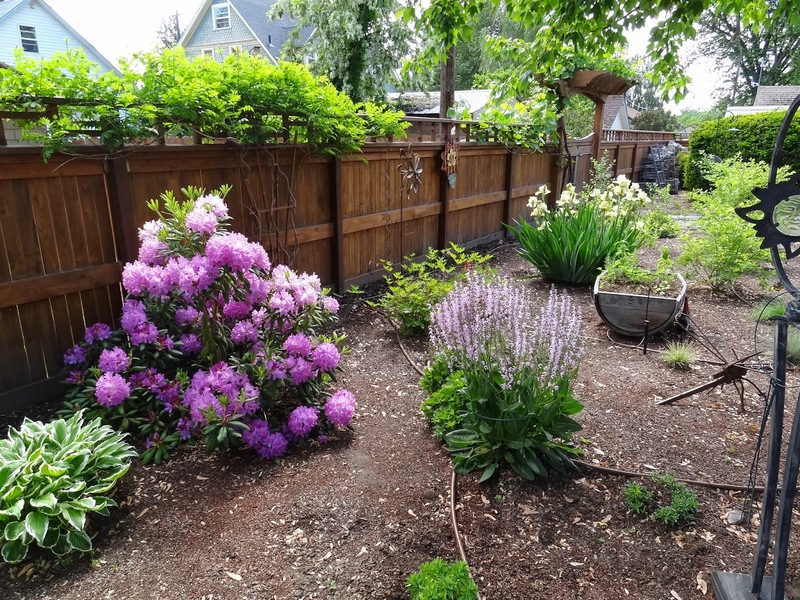 Thanks for sharing such beautiful photos of your garden. It was a lovely tour and makes me want to sit and have a cup of tea! Have a wonderful day with you gorgeous flowers! I must tell you that I think your garden is the prettiest one I've seen! You and Mr Squash House have wonderful green thumbs - it's like a beautiful park!!! What a beautiful tour! Your flowers are gorgeous. Beautiful flowers! It is great to see so many big flowers (and the lovely little ones too) when our garden is just waking up after the cold season. 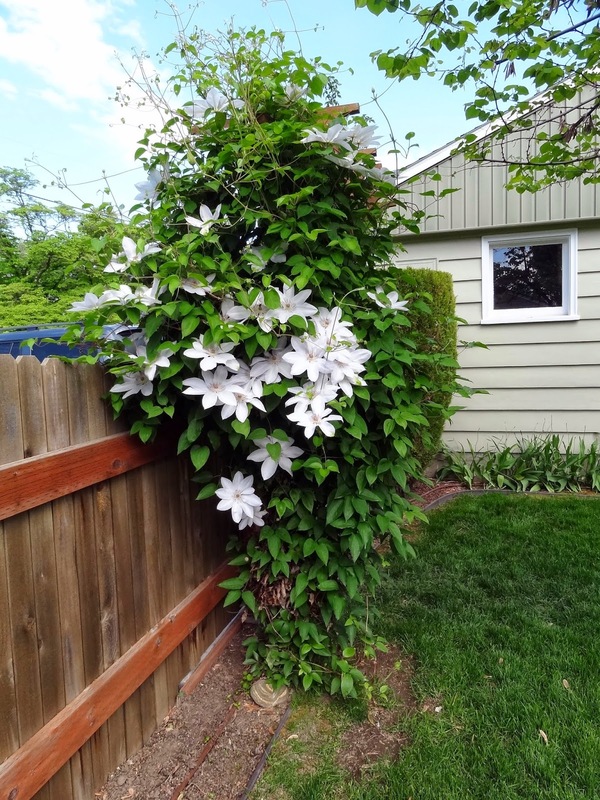 Love your clematis, they are sure blooming nice. Barbara sure loves her new trellis! 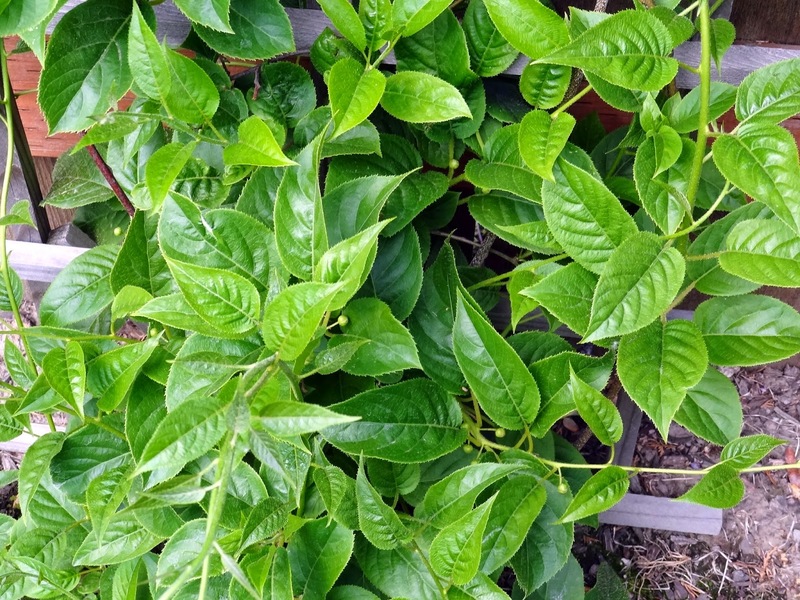 I am also so excited to see kiwis on your vine...I think I have some starting too! Keep taking it easy, we all want to see you get back to sewing and gardening! Simply gorgeous. You definitely have a talent and a green thumb. Your yard is a park if you ask me and it is gorgeous. Hugs!! So happy you are feeling better and healing more and more each day. Oh, your garden is so lovely. I'm just drooling over Bern!!! I love clematis and can't grow them for love nor money!!! Glad to hear you're improving. Take it easy so there's no setback. Your garden looks beautiful, as always. I think I need you and your DH to move to England - next door to me - and take over doing my gardening for me please. Oh Candace, I just love everything in your yard! Bern is awesome - can't believe he has such a long blooming season. Hope you didn't over-do on the yard work. Now you can sit back and enjoy all of the beauty! You have a dreamy romantic garden, Candace! Beautiful blossoms and yummy fruit trees! So nice to know you are recovering well. Have a great week! I love the garden tour! I can never see too much! 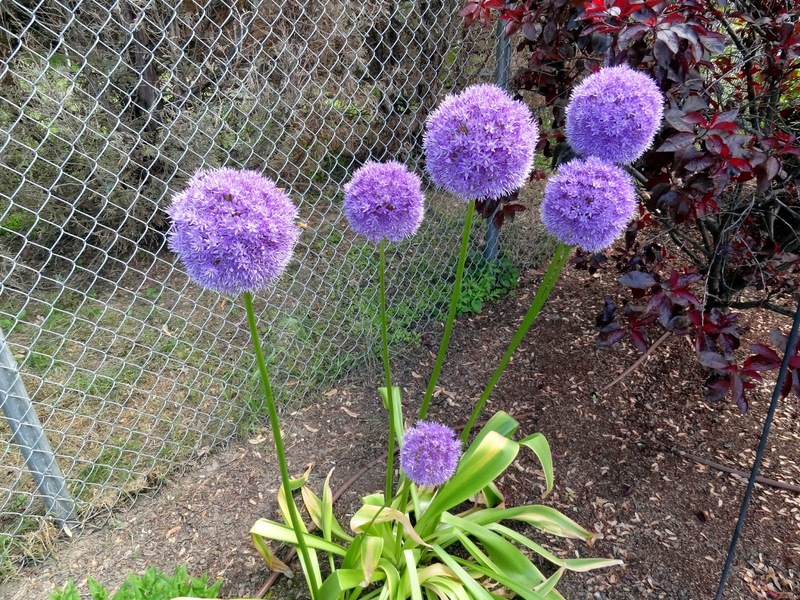 I especially like the Alliums. Glad your recovery is going well. I have back issues myself. I'm glad you got help with yours and are getting better. Slow and steady, friend, slow and steady. You'll get there, I know it. The garden looks wonderful. You'll be back to normal before you think. Thanks for the pictures. I love seeing your garden. Kiwi! I wonder if I could grow Kiwi. Hope you reach your goal soon. You and your hubby certainly have green thumbs! Your plants are amazing and look so healthy. Glad to hear that you are on the mend and will soon be playing with fabrics again. Thanks for sharing your beautiful garden Candace. Have you tried chamomile as a stepable also? My roses are in bloom too but I have never tried to grow a kiwi. The foliage is beautiful. 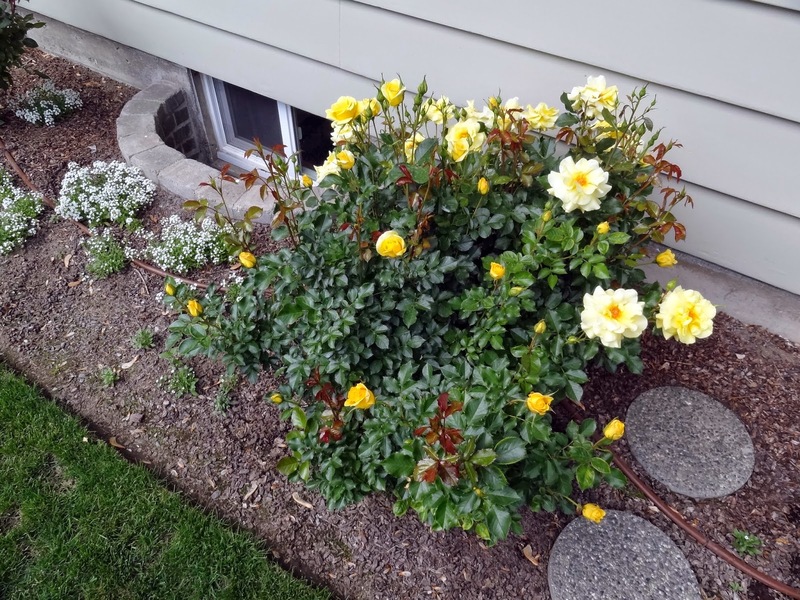 Are they frost resistant or have to go inside each Winter?